Cavan midfielder Gearoid McKiernan has apologised to Monaghan defender Drew Wylie following the recent sectarian abuse controversy. McKiernan was handed a two-match ban after being found to have verbally abused Protestant Wylie using sectarian language in a recent McKenna Cup game. The Cavan man will not be appealing against his ban, which is now over. 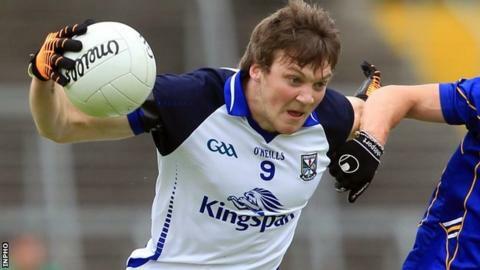 Ulster GAA president Martin McAviney said that McKiernan had given a "personal apology" to Wylie. "I welcome this outcome and I compliment Drew for his generosity in accepting the apology," added Mr McAviney. "I want to also acknowledge the action of the player against whom the disciplinary sanction was initiated for his response in dealing with the matter." McKiernan was sent off by referee Sean Hurson following his comments at Wylie which followed a foul by the Monaghan player on Cavan's Martin Reilly. Monaghan's Paul Finlay was also red carded after reacting to McKiernan's comments. The incident was believed to be the first time that a red card has been deployed as a punishment for either racist or sectarian abuse after the GAA changed the rule at last year's Congress at Croke Park in February. Crossmaglen player Aaron Cunningham, who suffered racist abuse in the Ulster Club Championship Final in 2012, said that McKiernan's ban had been too lenient although GAA sources have pointed out that a two-match suspension was the longest the Cavan man could have been handed under the association's rules. "I don't think two games is really going to teach anybody a lesson," said Cunningham. "I raised the issue a number of years ago publicly and behind closed doors and they promised me that they would take it a lot more seriously and clamp down on it. "But their actions, both in my case and in this case, doesn't really seem to fit." McKiernan's ban saw him missing both the McKenna Cup semi-final and Saturday's final defeat by Tyrone.